Scroll down to the bottom of this article and you will see buttons allowing you to print the page out or email it to yourself. Using them could help you boost your memory, according to recent research. Researchers from the University of California have found that saving documents actually helps us remember subsequent information. In the study participants were given two documents to read and were tested on their memory of the second document. The people who were asked to save the first document after reading it were able to significantly improve their memory of the second document compared with the people who did not save the first document. It appears that the act of saving appears to free up some of our brain processing power, allowing us to more easily remember the next set of information we face. This could be an important finding because we are being faced with an ever growing amount of information to process. It took several thousand years for all of human knowledge to double by the 19th Century. A hundred years after that it doubled. In the past two years alone the amount of information ever known by humans has doubled. Estimates are that in 2015 it will double between January and August. Never before have you been required to remember so much material – and our brains are not coping well. The simple act of saving each document – even if you are never going to open that file – appears to help you remember the next thing you do. 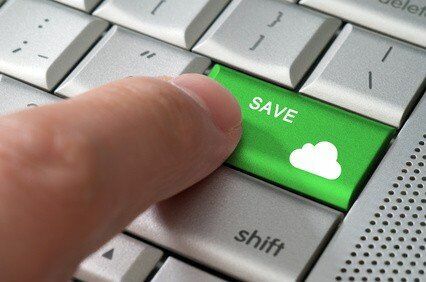 So, pressing a “save button” on all the information you need is a good idea. It appears it will boost your memory in this information-rich age.